Every November there’s a good chance that you’ll hear a conversation in the Netherlands that goes something like this: “I just came back from the store and they already sold Christmas decorations! Really? Sinterklaas didn’t even start yet! Every year they start selling the Christmas decorations earlier. What a shame!” It’s no wonder that stores are selling Christmas decoration so early, given the rising popularity of Christmas over our own local holiday Sinterklaas. Already for many years, many people have not been celebrating Sinterklaas anymore, and the blame is put on globalization, or, to be more exact, Americanization. Sinterklaas (a traditional figure based on Saint Nicholas) is celebrated annually with the giving of gifts on Saint Nicholas Eve (5 December). He traditionally arrives by steamboat from Spain each year in another city on the first Saturday after 11 November. He then parades through the streets on his white horse, welcomed by children cheering and singing traditional Sinterklaas songs. His Zwarte Piet (Black Pete) assistants (white men in blackface with a wig of black curly hair and dressed up like a 17th-century page in colorful attire—more on that later) throw candy and pepernoten (small, round, gingerbread-like cookies) into the crowd. All of this is televised on national TV. In the period between Sinterklaas‘ arrival and Saint Nicholas Eve, children put their shoes next to the fireplace (or when you don’t have one of those, under a small open window or any other place your parents let you believe a full-grown man can crawl through) before going to bed and singing a Sinterklaas song. My sister and I would also leave some carrots with our shoes “for Sinterklaas‘ horse,” of which only the stumps would remain in the morning, because my father had eaten them all after we went to bed to make it even more believable that Sinterklaas really visited our house. We would also find a small present or candy in our shoes, which was of course the reason we would be awake much earlier than usual. 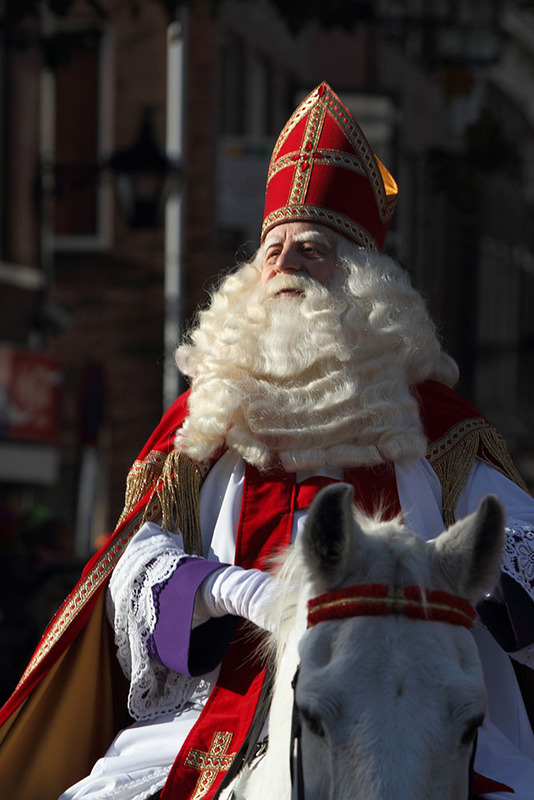 In the Netherlands, a nation with Christian roots, Christmas has been around as long as Sinterklaas has. It has always been celebrated (reluctantly) one day with your family and one day with your in-laws (yes, we have two Christmas days). Fights would (and still will) break out about which family you would visit on the first day, but there isn’t much gift giving involved. That was reserved for celebrating Sinterklaas, and not only for children, but for adults too. Adults write each other snarky poems and/or construct surprises (pronounced as the French surpris, not the English way), a very creative way of gift wrapping by making something out of cardboard or other solid materials, which contains the gift and some substance as disgusting as possible (usually syrup and Styrofoam, or any other sticky/disgusting combination). However, with Hollywood movies came the commercialization of Christmas and therefore the decline of celebrating Sinterklaas in favor of Christmas. As soon as the children don’t believe in Sinterklaas anymore, the family usually shifts the celebrations to Christmas and puts the gifts under the tree. The poems are sometimes still there, but the surprises have disappeared. This makes a lot of people in the Netherlands feel sad because they think we’re losing a tradition, while in fact, they are the cause of its disappearance. Is losing a tradition like this always a bad thing, you may ask? Not necessarily. Holding too much onto one’s traditions causes a lack of progress in society. Not marrying outside of your religious circle, pulling the head off a live goose for entertainment, and football matches available for men only are examples of traditions that have vanished when society thought they were outdated and wrong. Even our beloved Sinterklaas celebration has something outdated in the form of Zwarte Piet (Black Pete), Sinterklaas’ helpers that help him to get all the presents to the children. Although as a child I loved Zwarte Piet for being so funny and throwing pepernoten at my face, as an adult I can’t see past the colonial relic of the white man wearing blackface acting like fools while poorly emulating a Suriname accent (Suriname is a former Dutch colony in South America where we used black slaves to work on our plantations). I didn’t always think like this. I never stood still by the fact that Zwarte Piet may be offensive and racist to some until 2013, when the discussion about the controversial figure of Zwarte Piet started to intensify. Before that it simply didn’t concern me; I never considered that the black make up that people would put on their faces was in fact blackface. I never saw race when I saw Zwarte Piet, and I was convinced other children wouldn’t see that as well. Change never comes from those who are unaffected. However, when the discussion flared up in 2013 I started reading interviews with black people and started listening to what they had to say. They told stories about how they hated the Sinterklaas celebration because people (children and adults) would call them Zwarte Piet and make racist remarks. They were told this by their classmates in elementary school or while playing on the street, which I think must have been very traumatizing. As adults, the abuse continued by children calling them Zwarte Piet. For them it didn’t feel they were included in this big children’s celebration. When I heard those stories I knew I was wrong and felt ashamed that I hadn’t figured it out sooner. Although not black myself, I’m part Turkish. Knowing the amount of racism Turkish people have encountered when they started to settle in the Netherlands as immigrants, I feel I should have known better. Now the celebration of Sinterklaas in 2014 has come and gone and I’m more convinced than ever that something has to change. Slowly more people are waking up to see that Zwarte Piet is in fact racist, mainly due to the racist slurs of the defenders of Zwarte Piet. The awakening of these people was touched off by events within the Netherlands, but are certainly influenced by globalization. The way the international community speaks with shame about our tradition and that many people still defend that tradition also reaches the Netherlands and has an influence on people’s behavior. This happened before with the famous number 39 with rice incident, where a judge on Holland’s Got Talent made racist remarks to one Chinese contestant, asking him if he was going to sing number 39 with rice (a reference to an item on the menu of a Chinese restaurant and basically stereotyping all Chinese people in the Netherlands). It initially didn’t cause a stir in the Netherlands until a clip of the TV show showed up on reddit and being criticized by commenters all over the world. Subsequently it reached other foreign media as well and from then on a huge debate broke out in the Netherlands about whether it was an innocent joke or pure racism. The same is happening with Zwarte Piet, where people on the Internet and foreign media are criticizing the fact that we still keep him around in the Sinterklaas celebration. 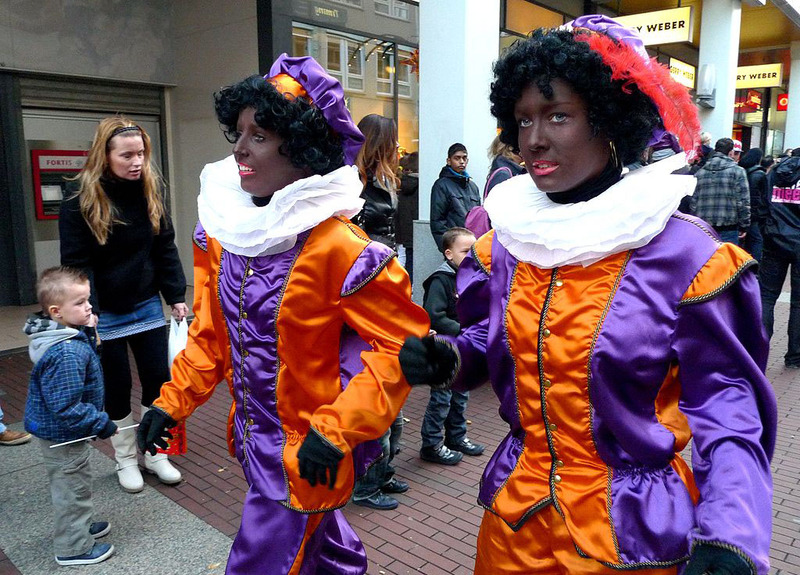 The effect is that in 2014 there were already changes made to Zwarte Piet’s appearance in some places. Although still not acceptable and not nearly enough, it is a start. This is the real power of globalization. Because we are more interconnected we see more quickly what’s wrong in other people’s societies and have the ability via the Internet to let them know. Some might say mind your own business because you don’t understand the culture, but as a man with experience with many cultures, I say we must be able to criticize and debate with each other to come to a better world for everyone. Many defenders of Zwarte Piet often say that foreigners don’t understand our culture and therefore can’t claim that Zwarte Piet is racist (Click here for an excellent article about the 10 most common excuses Dutch people make to defend the racist tradition of Zwarte Piet). However, we must stop playing the culture card when racism is involved and be able to admit our own mistakes. Only then will globalization be a positive thing instead of metaphor for a bunch of Western multinationals taking over the world. So people of the world, please criticize those that still defend Zwarte Piet. We can keep our tradition of Sinterklaas, but the Zwarte needs to go out of Piet. Interesting article, informative and well written. Globalization helps everyone to see the good and bad in everyone’s culture. Hopefully this will help bring people closer together in understanding each other.